Do you still need another treat for your cookie tray? Or perhaps you skipped baking all together this season and now feel obligated to bring something tasty to the family Christmas gathering? This is an easy, fun solution you can force the kids to do for you. Of course, if you do that you’ll deprive yourself of the pleasure of pummeling out your holiday stress crushing that bag of mini candy canes. There are so many options for these treats. 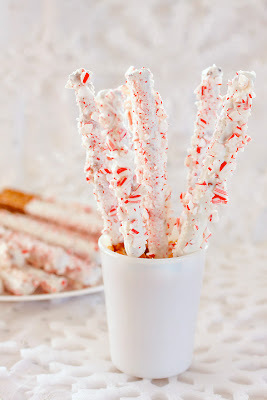 White chocolate coating looks beautiful with colored frosting drizzle and candy canes are always striking and festive. Oooo or indulgent dark chocolate and caramel scattered with chopped nuts would be good. Then there are countless dipping devices too. Pretzel sticks, mini pretzels, potato chips, Oreos, thin chocolate wafers and even dog bones for your favorite furry friend. My personal favorite this year are Biscoff cookies. They’re a thin, crunchy cross between graham crackers and gingersnaps. I know you’re busy and won’t stall you any longer. Let’s get started! Switch up the colors and candy for other holidays, celebrations or game days. Lay out several feet of wax paper near your dipping area. Melt white chocolate coating in a microwave safe bowl, or in a tall glass for pretzels on high for 30 seconds. Stir and microwave 30 more seconds. Repeat until melted. Dip dipping devices into coating shaking off the excess. 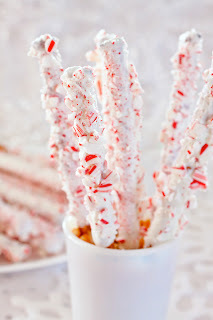 If using crushed candy canes or nuts sprinkle the base area on the wax paper. Lay the dipping device down and sprinkle the tops and sides. Let set. If dressing dipping devices with icing, melted chocolate or caramel, first let the coating set then drizzle as desired. We did this for the kids' parties at school last week. I found chocolate and sprinkles for days, but it was a lot of fun. Great pics! Great idea! I definitely need something like that for tonight. I didn't want to spend too much time baking. Thanks! These are perfect! 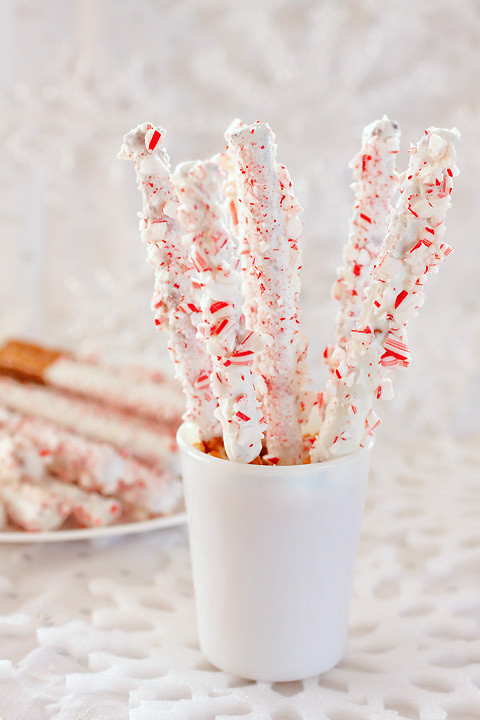 We have yet to make any treats at all and I am bookmarking these for Christmas Day snacks. Thanks and Happy Holidays! Oh my ! They look so very pretty..Thanks for sharing such a wonderful idea :-)Happy holidays ! 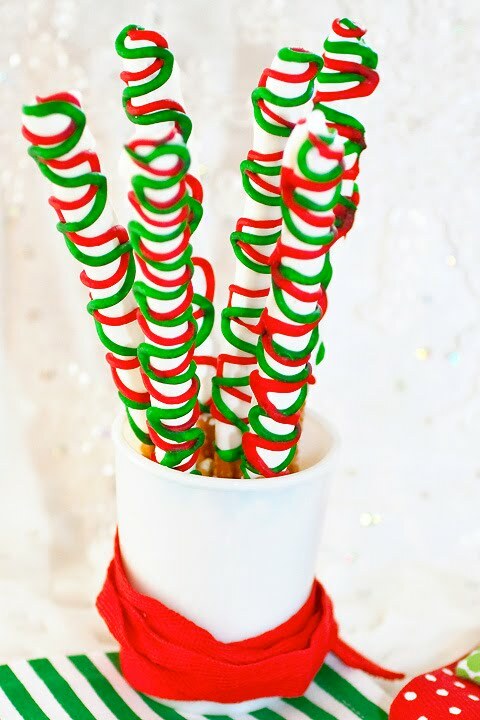 Love the look of the candy cane version! It's amazing how delicious something salty turns when you dip it in white candy coating! It's so uncanny, or maybe not since it's the holidays and our thought are geared this way anyway, but I made almost the exact same thing you did. 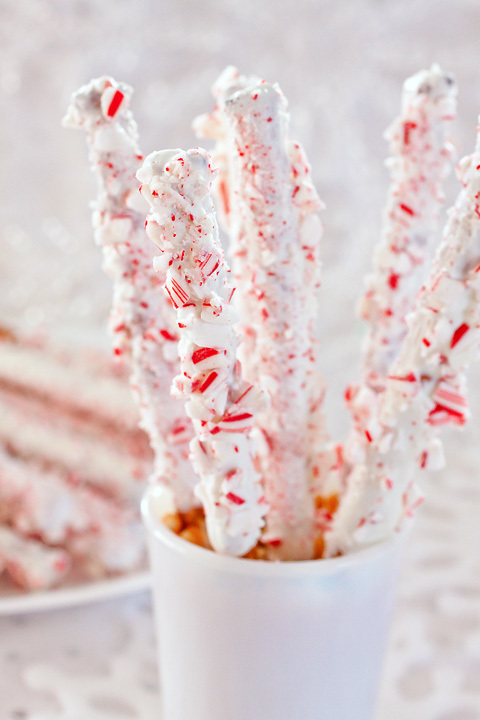 I dipped pretzel rods in white chocolate and then sprinkled with Andes peppermint baking chips. Amazingly good! Great idea! 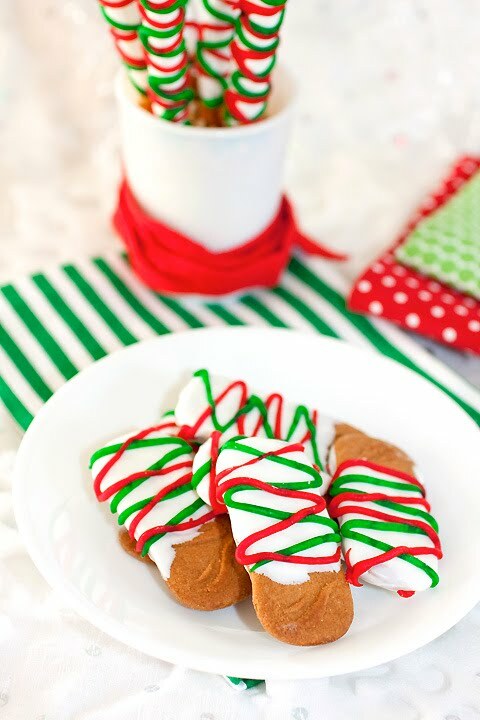 These are festive and quick, but don't feel last minute or rushed at all. Thanks for sharing the recipe and Happy Holidays! My grandson loves pretzels dipped in any thing I will have to make a batch for him. What a perfect idea - I have visions of last minute hostess gifts . . .Hope you have a wonderful holiday! We must get together in the New Year! Merry Christmas my sweet friend! The candy cane version is just precious. You always are giving me such great ideas! I wish you the Merriest Christmas. Thank you for always infusing my days with such great eats, sweet words and thoughtful comments....I'm thankful for you! Just beautiful Laura...so festive & perfect for the holiday season! These are so pretty, Laura! I hope you and yours had a wonderful Christmas weekend! This is a great idea. I wish I thought of it as part of my gift baskets. Love the one with red and green icing. Looks so bright and festive! And they look so fun to make! These are so pretty ~ Love the green and white ~ Looking forward to seeing all your creations in 2011! Stopping by to wish you a happy new year! Buckeyes. Ooo Peanut Butter and Chocolate Oh My! Elves’ Favorite Dessert. Run Away!